In December, Petra von Petra von Schenk Consulting started a blog parade about plans for 2016. I only found out about it on Monday, but I decided to take part and share my thoughts about last year and my future plans. Looking back, 2015 was quite exciting! I ran and presented my first webinar in June, I launched my podcast in August and I launched a number of new courses throughout the year so that people can focus on specific areas such as business English, writing or they can work through my audio courses in their own time. I’m not sure why I didn’t think of doing a podcast earlier. I’ve listened to them for years, even ones about English learning. Then I suddenly had the idea that I could do that too! Despite all the excitement around live video-streaming, I think there is still a place for audio content, particularly when you’re creating it for people who want to improve their listening skills. So if you don’t know about the podcast already, why not head over to the podcast page or check out English with Kirsty on iTunes or Stitcher. I also started my newsletter and enjoy the increased interaction that I had with people who read the newsletter, comment on blog posts or interact on Facebook, Twitter and Xing. Social media became more of a focus in 2015 – all of the channels were there, but I set up a plan to make sure that I shared relevant content consistently. Throughout 2015, I’d been busy networking and making new contacts. As well as general networking, I had been building a small business support network for myself with people who do the same or similar work. Rather than seeing these people as competition, I think we all benefit from sharing ideas, discussing solutions to problems, helping to promote each other’s services and generally having someone to chat to for encouragement or a fresh perspective. At the end of 2015, I had a really interesting conversation with another language teacher who has published her own book. At the end of our chat, I was already planning out a spreadsheet with a table of contents for mine! January has been a very busy month in terms of writing. As I write this, I’ve finished the first draft and I’m about to start the editing process. 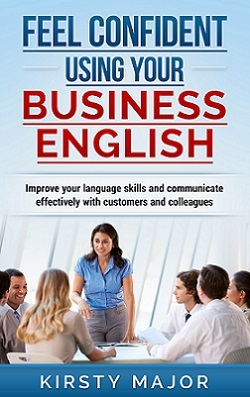 The book will have 50 chapters, in which you’ll find tips for specific situations in which people need to use their business English, solutions for language learner problems, mistakes to avoid and ideas on how you can make faster progress with your language learning. If you want to know more about the book and when it’s released, you can sign up for the monthly newsletter at the end of this article. One of the reasons that people come to me for help with English is that they want to apply for a new job and they know that the interview will be in English. I know that this can be a stressful time, so I’ve designed new one-to-one training sessions that help people to produce good quality CVs in English and to Perform well at interviews. I’m going to launch this training at the beginning of February and there will be a prize draw in which two people will win a training session of their choice from the career page. Further details will be in February’s newsletter. Then I’ll be busy with the book launch and promoting the book. I think this will be a great way to engage with new people who don’t necessarily want one-to-one training, but who would be interested in tips and creative ideas about language learning. I think that consistency and continuity are important, so as well as all the new projects, I’ll still be offering my customised training, posting content on social media, writing my blog and doing all those day-to-day tasks that you do when you work for yourself! I think that’s enough to be getting on with for now, but I am also considering opening a business English club with an online community and group training sessions later in the year. Last year, I had a pretty definite plan about what I was going to do. The reality ended up being nothing like my original plan – but it was better! I don’t believe in making resolutions for the new year, which you break after the first couple of weeks, but I do believe it’s important to generate new ideas and to create a plan about how you’ll put them into practice. If anyone has any questions or comments, do let me know! I love to know who is reading my blog or listening to my podcast, what they think about the topics, what they struggle with in terms of learning English and how I can help. If you want to be the first to find out about the book or the interview training, or you are generally interested in information about learning English, you can sign up for the English with Kirsty newsletter. Thanks very much :) What is MAWSIG?